The last few years have seen a healthy resurgence of the singer-songwriter, with a great number of outstanding albums released on both independent and major record labels. They run the gamut of styles from the solo folkie to the very eclectically instrumented. But what about the non-songwriting singer? Back before the rock & roll days when crooners were king, composers hardly ever sang their own music on record. Even when the folk boom of the early 1960s first started, most well-known performers did either traditional or other people's music. But ever since Bob Dylan, it is almost almost a given that folkies write most of their own material. Judy Collins and Joan Baez started out as non-composing vocalists but over the course of their careers moved toward writing more of their own music. This week we have one of those relatively rare albums by a fine folksinger who is not in the practice of writing her own material. She is Mollie O'Brien, and her new release is called Tell It True. To folk and acoustic music fans, Mollie is probably best known as the sister half of the sibling duo of Tim and Mollie O'Brien, formed with her younger brother who was a founder of the Colorado bluegrass outfit Hot Rize. It was in 1980 that Tim convinced his married sister to come from Manhattan to Boulder, Colorado, to start performing with him for some festivals. They sang with those rare vocal harmonies that come from growing up together. Tim meanwhile, launched a solo career, becoming increasingly respected as a songwriter, with some of his songs being recorded by Nashville country artists. Tim also has a simultaneous musical project called the O'Boys, doing more straight ahead bluegrass, as opposed to the sophisticated so-called "new acoustic" music he has recorded under his own name. Tim and Mollie have recorded three albums together, mostly of traditional music featuring fine, creative acoustic backing with some of the significant figures in the New Acoustic realm in attendance. Mollie had recorded her own solo album in 1987, and was part of a group described as having the most carefully-pronounced band name, the Mother Folkers. Now Mollie O'Brien is out with a new recording under her own name, produced by and featuring rather prominently her brother Tim. Though Tim doesn't sing harmonies as much as on the joint Tim & Mollie O'Brien albums, Tell It True is in much the same vein, in terms of sound, which means it's just superb. Ms. O'Brien has a remarkably clear, appealing voice with dead accurate pitch and an easy-going delivery that belies her vocal prowess. And as on the joint albums with her brother, the accompaniment is by some of the finest players on the New Acoustic scene, including Tim, who is no slouch on the mandolin, Dobro virtuoso Jerry Douglas, who has produced Tim's albums, Darol Anger of the Turtle Island String Quartet on fiddle, Scott Nygaard on guitar and Mark Schatz, who worked with David Grisman and is now part of the O'Boys, on acoustic bass. The O'Brien's friend and fellow Boulder-resident John Magnie of the Subdudes lends his keyboards to the proceedings. The album ranges from very traditional material to contemporary songs, from gospel to jazzy to Western Swing, and even includes a wonderful acoustic treatment of a Terence Trent D'Arby pop song. The selection is really interesting, something that is a luxury of not being the songwriter. And virtually every one of the dozen tracks is a gem with either Ms. O'Brien's vocal shining or the musical arrangements being brilliant, or both. The album provides some opportunities for instrumental solos, but the focus remains on Ms. O'Brien's instantly captivating vocals. Mollie O'Brien's new album Tell It True shows that you don't have to be a songwriter to make an excellent acoustic folk-influenced recording. While Ms. O'Brien has been making joint albums with her younger brother Tim in recent years, in which they share the vocal spotlight, this recording illustrates just what a fine singer Mollie has become. Her sense of taste, and her prodigious technique, disguised under an almost casual sound, shows her to be among the finest voices on today's folk scene. The album also illustrates the freedom a non-songwriter has in selecting a wide range of interesting, high quality material to include. Tim O'Brien is still quite in evidence as producer, multi-instrumentalist and occasional background singer, and he brings along some of the finest acoustic players around to add to this album's level of quality and taste. The result is a CD you'll just want to hear again and again. Tell It True is also quite tasteful in the audio department. There are a few subtle electronic effects here and there, and sometimes Mark Schatz' acoustic bass doesn't sound as rich as it might, but overall engineer Kevin Clock, who has also worked on Tim O'Brien's albums, did a fine job. The recording has a refreshing lack of dynamics-robbing compression. 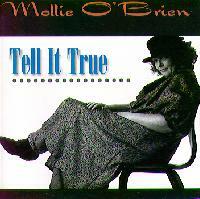 Fan of New Acoustic Music, folk and just plain good singing will find much to enjoy on Mollie O'Brien's Tell It True.